I hope this post finds everyone safe and dry. We were fortunate up here in New Hampshire. Though trees were toppled and thousands of people lost power, Hurricane Sandy did not wreck the kind of devastation Tropical Storm Irene inflicted in August 2011. Obviously, millions of people to our south were not so lucky. Our hearts go out to those who suffered the worst of this storm's wrath. We will continue our weekly hiking this Thursday. The girls and I are used to getting out there on a regular basis; I'm hoping our habitual 8-13 mile, all-weather, steep mountain hikes will keep us in decent shape for our Camino. I know we'll still have an adjustment period once we begin, since day-after-day-after-day walking is a lot different than once-a-week hiking, but at least we'll be well-used to dealing with the cold and the snow. Also, White Mountain terrain is rugged and tough, while most of the Camino is countryside walking (or so I hear, anyway). Also, the time will soon come to buy updated gear. We already have most of what we'll need for next March, but we do need proper Camino shoes and, for the girls, bigger backpacks. Once I've got the first round of our fundraising underway, I'll concentrate on buying what we need for The Way. Yesterday, while I was speaking at the Boston Book Festival, I was able to talk about our upcoming Camino walk and explain that we are doing this to raise money for two female-empowering organizations. It felt so good to announce our project to such a large audience! Me onstage at the Boston Book Festival. Photo taken by Alex. Be bold and mighty forces will come to your aid. -- Basil King. Welcome to GIRLS ON THE WAY. In March 2013, my daughters and I will fly to France and make our way south to the small town of St. John Pied de Port. From there, we will cross the Pyrenees on foot, enter Spain, and hike approximately 500 miles until we reach the city of Santiago de Compostela. We will follow the Camino Frances route of "The Way of St. James," or, as it's known in Europe, El Camino de Santiago. Alex will be ten years old when she embarks upon this journey, and Sage will be almost eight (her birthday is March 24). 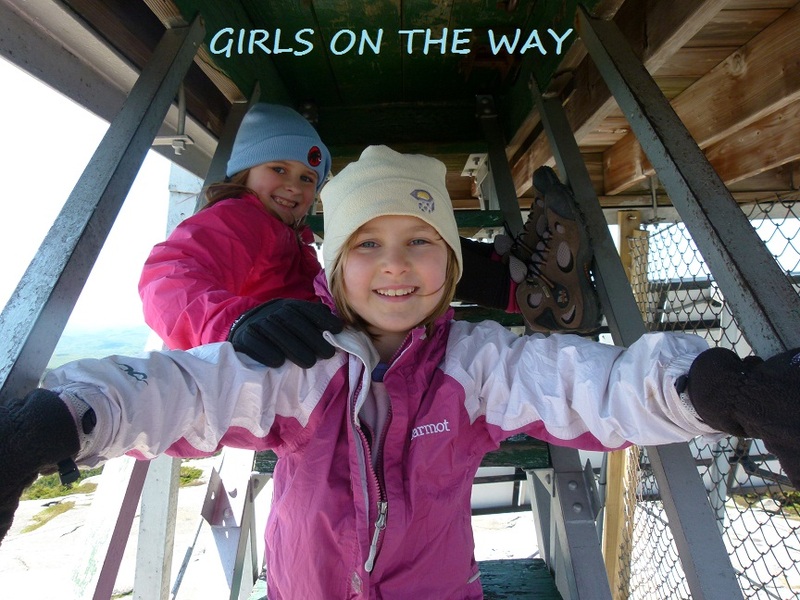 The girls are experienced hikers and they're used to dealing with all kinds of weather and terrain. They each have well over 150 peaks under their belts, and they both adore countrysides and mountains. Click here to visit our main website and read about our hiking and highpointing adventures. El Camino de Santiago is a pilgrimage; the remains of the apostle St. James are supposedly buried within the cathedral at Santiago de Compostela. Though we are not religious, we do respect the spirit of the pilgrimage tradition. Therefore, we have chosen to hike this 500-mile route in the honor of two female-empowering nonprofit organizations. We hope to raise $10,000 for GirlVentures and Global Fund for Women before we finish walking our Camino in April/May 2013. That's an ambitious amount of money and we will need a lot of help in raising it! One way for us to reach out to potential donors is this blog; my hope is that readers will enjoy what they read and show support for our endeavors by giving whatever they can to one or both of these fine organizations. During the next four months, I'll write of our preparations, excitements, fears, hopes, and fundraising efforts as we ready ourselves for this momentous undertaking. During March and April, while we're actually walking the Camino, I'll write of our adventures as often as I can. Please spread the word about this website and what we are doing; the more money we can raise for GirlVentures and Global Fund for Women, the better!